I have been looking for a pretty hair bow for a while now and I found a few that I quite liked but somehow I am not prepared to pay ₤10 or more on a tiny little cotton bow if I can just as easily make it myself. 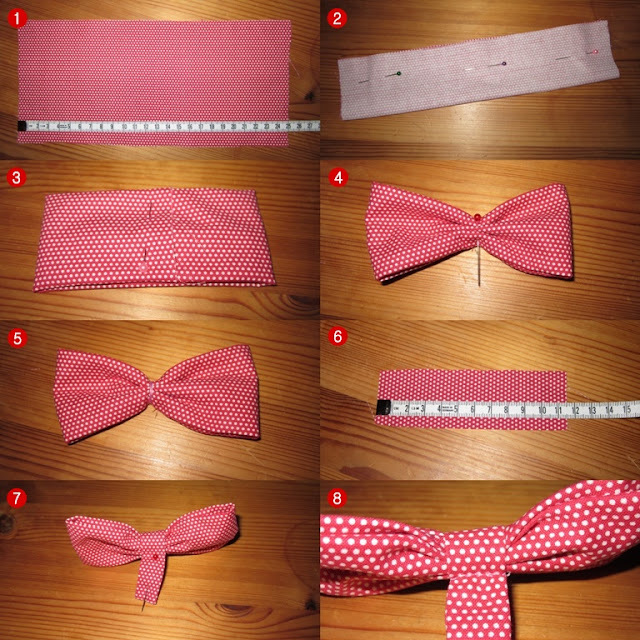 So I gathered some old cotton fabric snippets and made myself 2 lovely hair bows in just a few simply steps. 1) Cut out a piece of fabric, ca. 20-25cm long and 12 cm wide. 2) Fold the piece together outside in and sew along the open edge. Turn inside out. 3) Fold over each side and tuck them into one another in the middle. Sew both open ends together. 4) Tuck the piece of fabric together in the middle to make it look like a bow and fix with a needle. 5) Wrap a string of thread around the middle of the bow and secure it with a few knots. 6) Cut out another piece of fabric, 10-11cm long and 4cm wide. Repeat instructions of step #2. 7) Wrap this second piece of fabric around the middle of the bow and attach its ends together as shown. 8) Pull the second piece of fabric around the middle tightly and sew together manually. Cut off the extra cotton and you're done! Simply attach the bow to a hair pin, integrate into your hairdo and I am sure it'll be at least twice as nice.